We all know our feline friends treat every day as if it were their special holiday. With all the praise and attention they receive, it’s hard to fathom how we could love them even more! However, there really is a day when cat lovers around the nation pay extra attention to their kitties. It’s Happy Mew Year for Cats Day on January 2. Not only does this day give us a reason to slip a little more catnip to our furry felines, it also gives cats in need the chance for a fresh start. The founders, Tom and Ruth Roy, wanted cats to have a very special New Year's celebration all to themselves. Birth of the "Crazy Cat Lady"
The quirky and tenacious trope of a "Crazy Cat Lady" began in an article written about women who display an extreme amount of affection for their kitties. The wildly successful musical increased pop culture's love for our feline friends. The show ran for 18 years. The earliest known domestication of cats, or Felis catus, occurred during ancient Egyptian times. Cats were treated as royalty and held in the highest respect, becoming the most-prized possession of Pharaohs and highly esteemed families. Even the most fabulous cat deserves a little pampering! Treat your cat to a relaxing day at the "spa" by giving them a paw massage, brushing them a little longer, or even slipping them some extra catnip. Unite with your fellow cat lovers to throw a one-of-a-kind cat party! Create a maze of cardboard boxes and build tall towers. Maybe hang a couple of irresistible yarn strings. Even the most haughty of cats will have a ball. 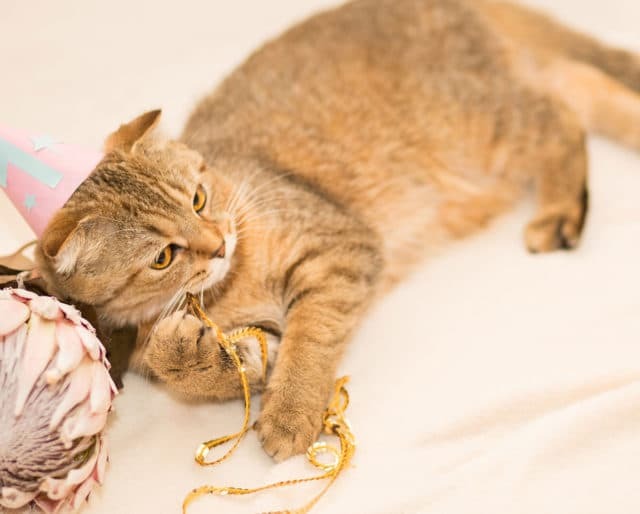 While Happy Mew Year for Cats Day gives us a chance to pamper the cats we already call our own, there are still a lot of cats out there who have nobody to love. Take the time to visit a shelter and share your love with our feline friends in need. Maybe you'll find one to adopt! The Hello Kitty franchise, valued at approximately $50 billion, has its own product line, anime series, and even a Hello Kitty Cafe! Our favorite comic strip cat grew into a multi-million dollar character whose lazy antics and knack for trouble launched movies, books, and a TV series. Grumpy Cat, whose real name is actually Tardar Sauce, is an internet sensation who captured the hearts of everyone after going viral for her perpetually "grumpy" face. Their large, adorable eyes and smushed faces make them irresistible, so we can understand why owner Taylor Swift works so hard to support their lavish lifestyle! Happy Mew Year for Cats Day gives all cats a chance to reflect on the past year and gear up for a "mew" year of opportunities. Whether it's finding a new sunny spot in the house for sunbathing, or even setting a new record for the most purrs per minute, the possibilities for "mew"ness are endless. If we're being honest with ourselves, do we really know where we would be without the love of our cats? There's a reason why cat lovers are so passionate about their feline friends; it's because they really are the best! Did you know there are way more stray cats admitted into shelters than dogs? Happy Mew Year for Cats Day also educates people on adoption!